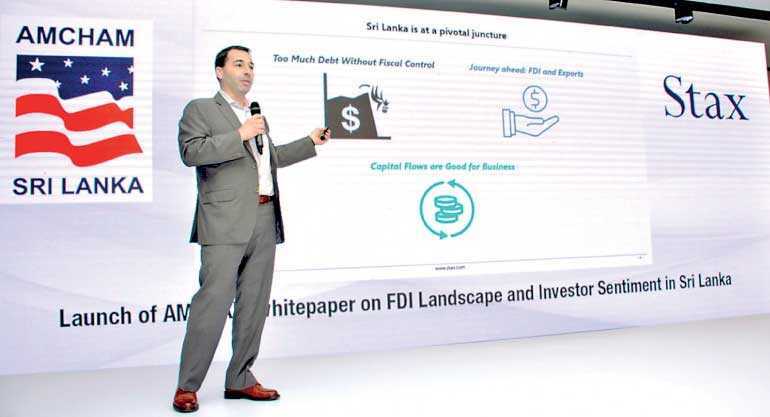 AMCHAM, in collaboration with STAX, recently launched the 2018 whitepaper ‘FDI Landscape and Investor Sentiment in Sri Lanka’ at a gathering of business and government leaders including Minister of Development Strategies and International Trade Malik Samarawickrama. Digitise data collection: At present, most FDI data is gathered via an island-wide paper survey. The need of the hour is to digitise the process of data capture to better enable the widest penetration of the survey and streamline subsequent analysis. Develop one umbrella organisation for FDI: Instead of having numerous line ministries with overlapping mandates for reaching out to global investors, there needs to be one central body capable of formulating policy, issuing guidelines, attracting investors and governing FDI flows. Negotiate favourable and clearly defined trade policies: Developing exports through Free Trade Agreements (FTAs) and bolstering Sri Lanka’s position as a country with preferential access to markets like China, India and Europe, will be the cornerstone of establishing Sri Lanka’s attractiveness as an FDI destination. Invest in education and vocational training to match industry needs and potential and improve productivity: At least 63% of respondents surveyed cited a shortage of quality labour. However, the problem isn’t necessarily a human resource shortage as it is a failure to fully develop the workforce and improve productivity of the existing labour force. STAX, Sri Lanka’s leading management consulting firm, has its headquarters in Boston, and branch offices across Chicago, New York, Colombo and Singapore. With a rich client base comprising 30+ local conglomerates and family businesses, 15 of the top 20 global investors and 25+ Fortune 500 companies, Stax prides itself on being a full service consulting firm – from strategy to implementation. If you are looking for a nimble, collaborative, and highly focused firm dedicated to finding implementable solutions, we invite you to find out more at www.stax.com.